Yul Brynner. ' Caption slip reads: "Photographer: Copy. Date: 1956-03-28. Assignment: Copy -- Robert Balzer. Meeting Cambodia's spiritual leader, the Venerable Mahathera Vira Dharmawara (left), during the latter's stay in January helped Robert Balzer (right) decide to become a monk, Mme. Indra Devi (in picture) revealed. 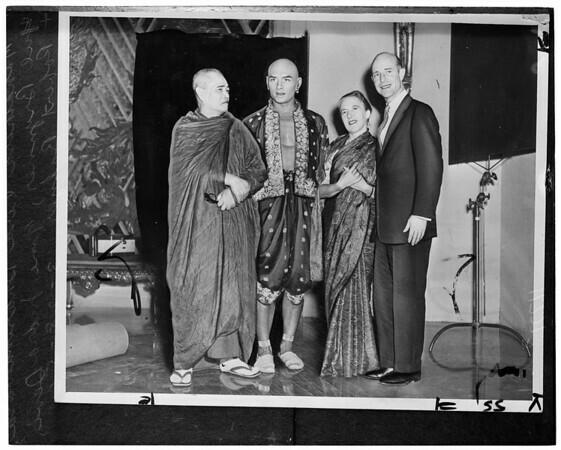 They're shown seeing actor Yul Brynner on set here as King of Siam."